Oh, no!! Huge scientific experiment on the South Pole went terribly wrong. 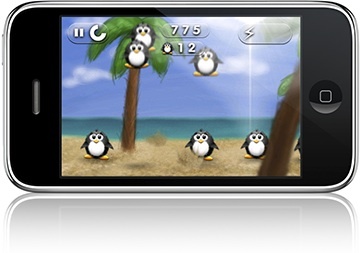 A flock of penguins was teleported to a desert tropical island. Though they were long for a vacation that's not exactly where they would like to spend it. You have been sent after them equipped with a portable teleport. Your mission is to get back home as many penguins as possible. The teleport discharges with every shot, so you have to recharge it once in a while. And still, it won't last long so hurry up before it's too late. ePingu is a trademark of Maxim Ananov. Apple, the Apple logo, iPod, and iTunes are trademarks of Apple Inc., registered in the U.S. and other countries. iPhone is a trademark of Apple Inc.